Our Communications Manager Liam Purcell has been reading a new book about poverty in the UK – and finds that it’s an excellent overview of a complicated subject. Working at Church Action on Poverty, I have often been asked by supporters or new colleagues to recommend a good way of developing a better understanding of the nature and causes of UK poverty. That was always a tricky question. Now, I’ll just advise them to read Breadline Britain: The Rise of Mass Poverty. Breadline Britain is a substantial piece of work, by two academics who have both played leading roles in research into UK poverty for over 30 years. Drawing on that expertise, they’ve produced a brilliant overview of the nature of poverty in the UK right now, how things have changed in recent decades, and also what we must do to tackle the problem. Most importantly, it’s a very accessible, readable book. It starts by covering the debates over how to define poverty. While this topic can descend into dull statistics, it remains grounded in reality here because they use the minimum living standard approach to relate the question to real lives. They show that there is actually a bigger consensus about the existence and nature of UK poverty than we sometimes imagine. But the next chapter, ‘Going Backwards’, paints a damning picture of how successive governments have not only failed to tackle the problem, but made it worse and worse. Subsequent chapters comprehensively cover nearly all of the topics necessary to understand how poverty works in the UK today. There are sections on the causes and roots of poverty; work and unemployment; the punitive changes to our benefit system; the housing crisis; inequality and economics; and the rise of food banks and food poverty (with a mention of Church Action on Poverty’s ‘Britain Isn’t Eating’ campaign). The book finishes with a chapter, ‘That’s My Dream’, which outlines some of the actions we need to take to tackle poverty. As I said at the start, the book is an ideal overview for anyone who wants to understand UK poverty better. It’s powerful and authoritative – I was particularly impressed by the devastating analysis of inequality and our dependence on the financial industry – whilst always remaining easy to read and follow. I have a few small reservations. It doesn’t pay much attention to rising prices and the Poverty Premium – an issue which Church Action on Poverty regards as a key injustice in the way people on low incomes are treated. And in the section on minimum living standards, I was surprised to see no mention of the Joseph Rowntree Foundation’s Minimum Income Standard – the most high-profile and practical application of the principle. I assume that the authors have some political or methodological disagreements with Rowntree about how to apply the principles, but the complete lack of a mention seemed odd. Also, whilst every chapter opens with direct quotes from people in poverty that illustrate the issues, the bulk of the content focuses more on statistics and economic analysis. I’d advise people to read this book – but to make sure they also listen to the real voices and stories of people who have experienced the issues themselves. 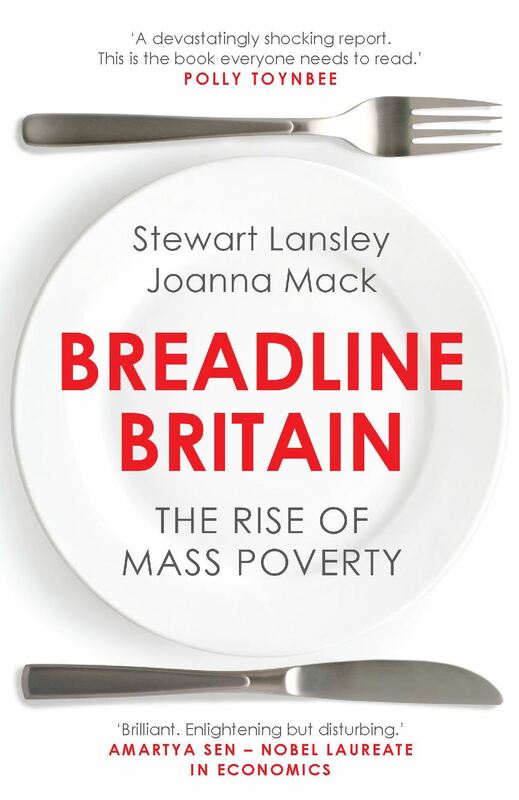 Breadline Britain: The Rise of Mass Poverty is by Stewart Lansley and Joanna Mack, and published by Oneworld. Click here to order a copy direct from the publisher. This entry was posted in Partners and allies, Reviews by Church Action on Poverty. Bookmark the permalink. You’re welcome to borrow a copy from the office library next time you’re here for a meeting!